Disclaimer: The ESS 252 was sent to us in exchange for our honest opinion in this review. Many thanks to ESS for giving us this opportunity. 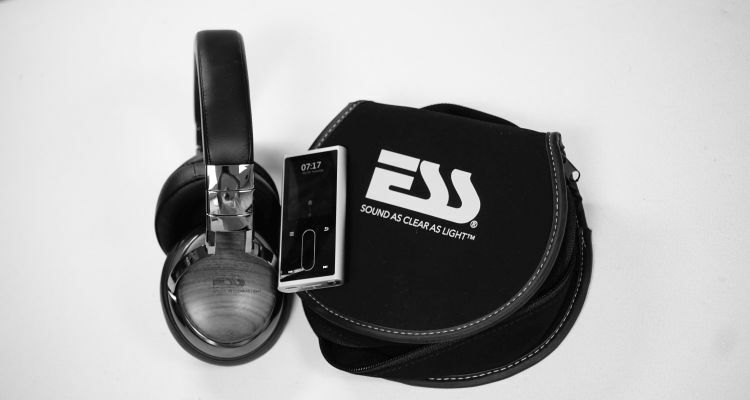 Not too long ago, ESS sent over a package that contained their 422 and 252 closed back headphones. I reviewed the 422 some time ago and enjoyed it plenty. Today, we will be taking a gander at the 252 model, which sells for $129.99MSRP. This company is known for their speaker dynamics. The previous model that I’ve reviewed from them, the 422, had excellent staging properties. So, I am very excited to see if their budget model in the 252 also shares some of the more expensive model’s character traits. The box was standard and came with a black zipper case, which seems to be the same one that contained the larger and more expensive 422 model. For now, I don’t want to see anything else in the budget to lower mid-tier for pricing ($1-150USD) or so depending on your view of it. I prefer things to be basic and not add any cost to the product. I don’t need a premium accessory kit in a budget headphone. Although, that is from an audiophile standpoint and not a general consumer. From a normal, everyday general consumer view, I might want to see a spare cable and a different case than the one that came with the more expensive model. But, it is fine. That is just personal gripes at play. It doesn’t include or exclude anything objective that is required. And, again, at this price, that is a good thing. Keep it simple here. 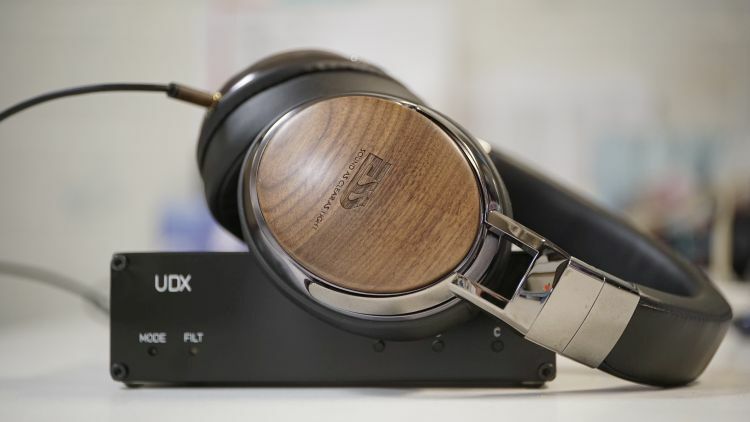 For $129.99USD, generally, you don’t really ever see Walnut earcups or really any type of wood applied to the design. 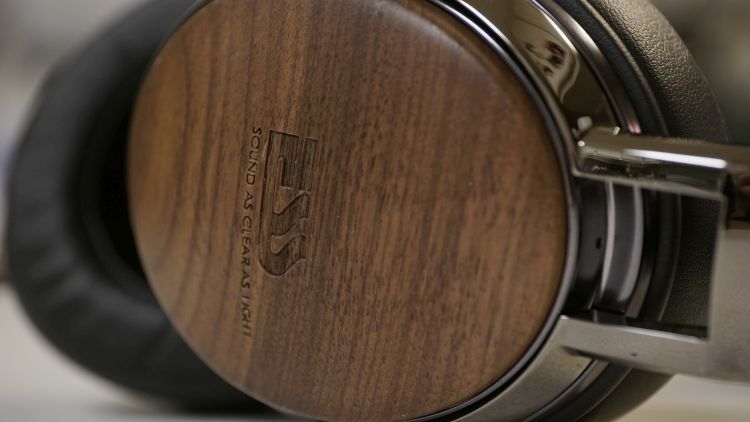 In this case, ESS went out of their way to include a nice, Fischer ‘Audioesque’ wooden appeal in a nice, thick cut Walnut. It looks very pretty, no doubt. The finish of the wood looks dry and I am a sucker for well-lacquered woods. 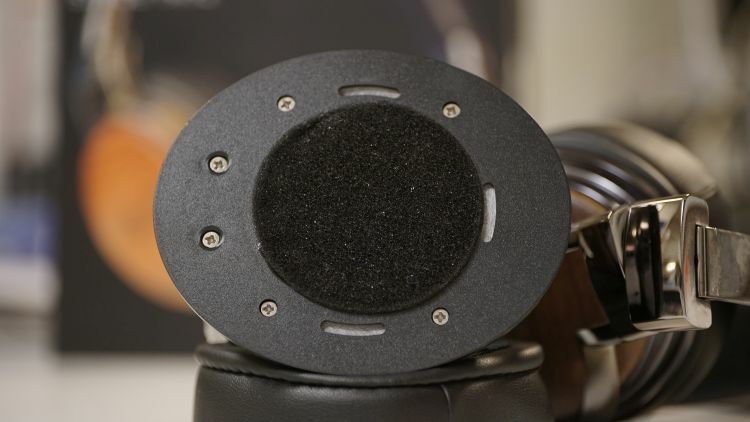 The earpads are what seems to be imitation leather, but they are soft and comfortable. The headphone has also what appears like plastic chrome exteriors around the earcups. It comes off as overly flashy just around what is very beautiful. It is a stark contrast. The Cable is also too long for a portable length cable, at roughly 6ft and terminated in 3.5mm. This headphone isn’t a monitor or made for usage with amplifiers, so I don’t understand their choice here on cable length. Perhaps an optional 1.5m cable could be offered at their check-out for those that want to walk around with the ESS 252. This set clamps significantly. You can stretch them out over some time by wrapping them over a stack of books or very gently bending the headband areas in the opposite direction. The headband has almost no padding on the underside and is quite hard. But, the earpads are very soft. The moderate heft and weight really do not help because wooden cups are hefty, you can’t really get around that. The set also, similarly to the 422, will become very warm in a short period of time. 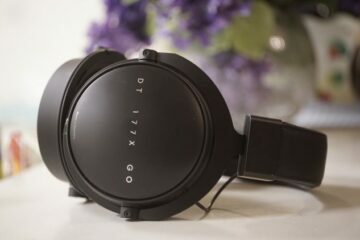 Due to the totally closed design that is absent any venting, the experience, as it would on any other completely closed headphone design, will get warm quite fast. I wonder what these would sound and feel like with velour pads instead of leatherette? The driver technology this company is known for is not really audibly present in this model, not nearly as well as they implemented in the more expensive model. This headphone is more budget oriented, after all. 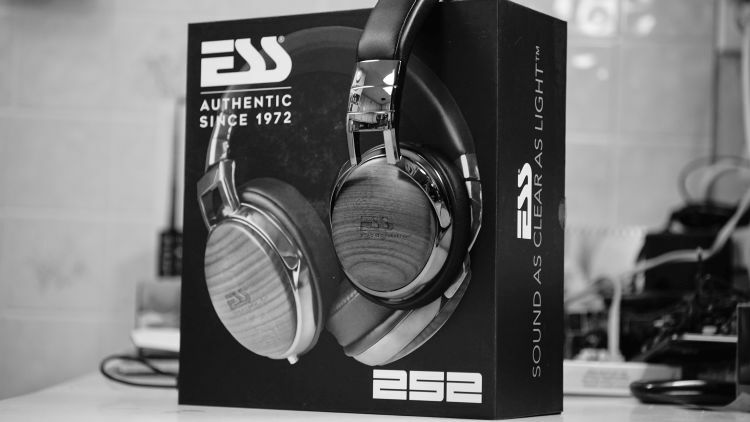 Sub-Bass presence on the ESS 252 is a bit soft and ill-defined. I get more of a large bloom on things that don’t dip low and that is not what I want to hear. The quantity of the bass allotted is just fine. It isn’t lacking at all. It just sounds one-dimensional on every low instance come along in a track. I have plenty of other sets that feel like they are dipping a lot lower and I can semi-hear and feel those excessively deep moments. 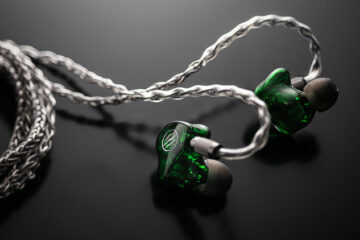 I cannot really experience them so well in this model as I could on the more expensive one, for example. I am not really okay with that when it comes to objective reviewing processes. However, on a macro level, I really enjoy the PRaT and musicality of the ESS 252 low-end. If you know me and my publications, I enjoy this type of bass experience. It is plentiful, broad and lacking in any annoyingly powerful physical slam and ‘kick-factor’. Just needs tightened up a little more at the very lowest level. The bass tonality is excellent for a musicality lover, such as myself. This is a fun, slightly warm and vivid bass that is not pure feeling. It is clearly meant to be enjoyable and not to be clinical or accurate in setup. I like this. This is what I want, but with more cleanliness and response. Of course, at this price, I can’t really obtain that. I can’t name any $129.99 over ears that are woody and also very efficient that also deliver a very deep and fun sounding signature. For now, musicality and tone are excellent. But, quality is indeed the problem. At this price range, I feel the bass fidelity to be just within what I would expect the current market value to be. I don’t get a sense of amazing clarity, but I do get a sense of amazing fun factor. The heft factor is just right for someone who enjoys bass, but the response factor simply doesn’t go low enough to enjoy a lot of the bassier tracks out there that I frequent. I suppose at $129USD, I can’t objectively complain much. The 252 is a moderately forward sounding set and combined with the dense bass feeling, I feel like most of the midrange is overshadowed by the heft of the bass experience a bit too much. The potential blend factor should be seamless, but the bass bleeds into the mids, audibly so. Typically, male vocalists and certain instruments like the cello, for example, are overly bassy and lacking detail in what I know to be a totally separate entity in the midrange frequencies in that track. The price tier tends to offer this type of bass to mid bleed anyway and that really isn’t a serious issue. Lower quality drivers almost always do that if the set has solid bass factors too, especially so in dynamic drivers. I can’t get the set to sound very forward and properly engaging for a midrange lover, like myself. Subjectively, that placement is important to me. But, objectively things are just perfect. It isn’t overly forward, and also is not recessed. This is kind of a dark sounding headphone overall on the low-end and into the lower mids. The treble tonality and brightness should be escalated a bit to compensate for the darkness down yonder, but it isn’t. It also is very tame and lacking a vivid appeal. That makes the entire headphone sound a bit dim and even a little hazy at times up in the treble regions. Treble impact is very soft and dynamic slam is very enjoyable. I like this type of physicality, but I prefer more brightness and vividness to the quantity levels. I find myself trying to raise the EQ on the upper regions but to no avail. Even with my Colorfly C8 and the excellent EQ on the Hidizs AP80, I am unable to get the sound up top that I crave. For now, the entire upper end on a flat EQ is very lacking in presentability and style. I feel like the treble is just lacking quantity there enough to do justice to a nice, full sounding experience. True, I enjoy the soft appeal and kick factor. But, I think this set is overly reserved in quantity. As far as fidelity goes, it leaves much to be desired. Poorly recorded tracks feel less dynamic and that is sometimes a good thing, but the set also has a tendency to feel a bit too blurred up top. By that, I mean fast sounding high hats and even piano or guitar shredding sounds like a washout sometimes. Not always. It just feels like it is struggling for detail, where the 422 doesn’t have that issue at all and things feel entirely separate from the midrange. I feel there is a lot of bleed into the mids from the bass, and also a lot of bleed into the mids from the treble end. The upper midrange is almost indistinguishable from the treble response sometimes. 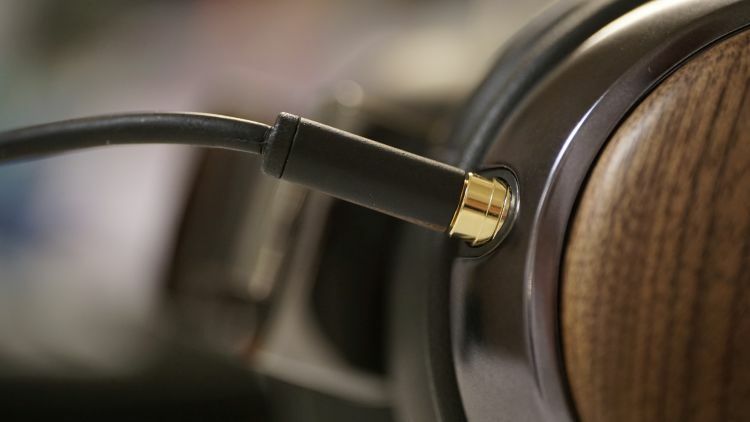 The headphone has an excellent depth of field for the price. In fact, I think it might be the best closed back in terms of stage-forward potential that I’ve ever heard in this price range. However, the bubble that is the void I am hearing, the width and height factors, are just moderately okay to me. I don’t feel anything special in the way of height and width, as well as separation factor. But, depth of field is excellent, no doubt there. Coherency is an issue sometimes in this pricing tier and I feel that to be the case here as well. The realism factor and how voices and instruments are realistically feeling and portrayed is lacking. I have some other sets in this price tier that feel more realistic, but none that feel as deep-reaching in the space in front of me. n this pricing tier, there are very few sets that exist, especially in a closed back, that I can safely say that offer excellent overall imaging. Yes, this lacks in width and height, but I am very impressed by the sense of stage-forward sound that is offered. This type of excellent depth of field was present in their more expensive 422 model. The clamp and lacking padding of the headband needs to be addressed. It has virtually no padding under it. Beyond that, the headphone has some bleed issues at times and on bassy or treble happy tracks that I am not fond of. The excellent depth of field is a serious win for me though and I admit that a lot of my favorite tracks, especially old Jazz standards, sound amazing through it. That sense of depth and space in a forward sense makes me really happy, as does the overall dynamically soft impact of the headphone from top to bottom. The treble needs work and should be boosted beyond what it is in a quantity sense of the word. Do I like them? Yes, I do. I enjoy the bass and depth of field a lot. Despite the headphone being uncomfortable and somewhat dark, it does have more than enough good qualities about it to lend itself some credibility. If they could release a v2 in the future, I am sure I’d like it even more.